Mayor Michael A. Nutter visited Parkway Central on Monday, September 29 to officially unveil the Library’s new green roof demonstration project. Encompassing 5,000 square feet on the south side of Parkway Central, the space holds 100 cubic feet of soil and more than 5,400 plants. The green roof project, which is a part of the Mayor’s initiative to make Philadelphia one of the greenest cities in the country, is the first green roof on a city-owned building. Green roofs offer environmental and energy-saving benefits—installations improve air quality, reduce stormwater runoff to city sewer systems, and keep buildings cooler in the summer and warmer in the winter. Several layers designed specifically for insulation, drainage, and waterproofing were installed below the layer of soil media (see attached illustration). The new demonstration space features a pathway that will allow visitors to experience the green roof up close—featured signage includes information on the variety of plants, as well as details on the layers installed and benefits of green roofs. 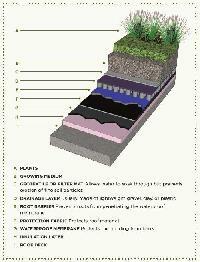 Click here to learn more about our green roof. This is something we can all be proud of. Thanks to all who participated and made possible expeditious execution of a forward-looking project.